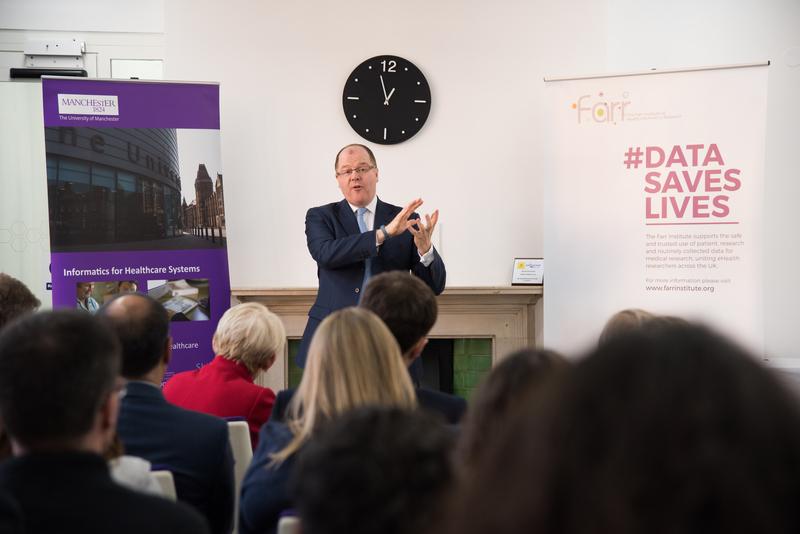 Life Sciences Minister George Freeman has opened the new home to the Health eResearch Centre of the Farr Institute at the University of Manchester, creating a North of England hub for some of the world’s best digital and health research. Vaughan House will be one of the leading venues in the country to develop new technologies that can empower patients to understand and take control over their own healthcare through smartphones, wearable devices and healthcare records. From citizen science experiments such as 'Cloudy with a Chance of Pain' looking at the relationship between arthritis and the weather to NHS-linked projects such as 'Clin Touch' looking at mental health symptoms and medication, the Health eResearch Centre is helping to connect citizens, patients and care-services for better prevention and care through technology. It is fantastic to see Manchester playing a central role in developing new 21st century innovations, supported by our annual investment of £1bn through the National Institute for Health Research. By shifting the digital power to patients we are allowing them to monitor their own health through things like wearable devices and apps.